If you have been diagnosed with periodontal (gum) disease, you’re not alone. An estimated 80 percent of American adults currently have some form of gum disease, ranging from simple gum inflammation to serious disease which results in major damage to the soft tissue and bone supporting the teeth. Not only is gum disease a threat to your oral health that can lead to tooth loss, but research also points to health effects of periodontal disease that go well beyond your mouth. Did you know that a major cause of periodontal disease is poorly-aligned teeth? This is because the bacteria living in the gums around crowded teeth are much more toxic and destructive than the normal bacteria found in healthy mouths! In fact, the misalignment that leads to periodontal disease continues to remain one of the most overlooked risk factors by the General Practitioner’s office. Additional studies have pointed to a relationship between periodontal disease and stroke. In one study that looked at the causal relationship of oral infection as a risk factor for stroke, people diagnosed with acute cerebrovascular ischemia were found more likely to have an oral infection when compared to those in the control group. PROVIDE LINK TO STUDY. Osteoporosis may lead to tooth loss because the density of the bone supporting the teeth may be decreased. Pregnant women who have periodontal disease may be seven times more likely to have a baby that is born too early and too small. PROVIDE LINK TO STUDY. If your teeth are misaligned, it could be more than a cosmetic issue. Undergoing orthodontic treatment to straighten your teeth may be a critical part of ensuring your overall health. Properly positioned teeth are easier to brush and floss than teeth that are crowded, crooked, or spaced too far apart. Properly aligned teeth can help gums “fit” tighter around them, which may lead to better periodontal health3. With maintenance of good oral hygiene, the chances of having plaque retention, tooth decay, and periodontal disease can be reduced. If your teeth are misaligned, Invisalign should be considered to straighten your teeth and help prevent periodontal disease—all without the hassle of brackets and wires. 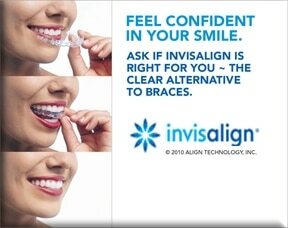 Straighten your teeth and protect your health with Invisalign! 1. Journal of Periodontology, November 1999, Vol. 70, No. 11, Pages 1313-1321. Heightened Gingival Inflammation and Attachment Loss in Type 2 Diabetics with Hyperlipidemia. Christopher W. Cutler, MD, Robert L. Machen, Ravi Jotwani, Anthony M. Iacopino. 2. Presented at the AADR in San Antonio, Effect of Invisalign® Aligners on Periodontal Tissues, Taylor, MG; McGorray, SP; Durrett, S; Pavlow, S; Downey, N; Lenk, M; Oxford, E; Dolce, C; Wheeler, TT. 3. Ong et al., 1998 Boyd and Baumrind. 1992. Zachrisson and Zachrisson, 1972. For a free consultation in our Northern Westchester Orthodontist Office, please call for an appointment today!